Landscape architects landscape design for residential development with podium deck and roof garden. Landscape architect services: Conditions. Landscape architects landscape design for atrium courtyard space to residential development. Landscape architect services: Detailed design to Tender. Landscape architects landscape design for new build residential development with public realm & podium decks. Landscape architect services: To Planning. Landscape architects landscape design for new build residential development with home zone. Landscape architect services: Planning, Conditions, Tender, Construction & On Site. Landscape architects landscape design for new build marketing suite landscape with public realm. Landscape architect services: Planning, Tender information. Landscape architects landscape design for new build residential housing. Landscape architect services: Planning, Conditions, Tender information. Landscape architect’s design for new build housing with shared space and natural play. Landscape architect services from planning to conditions. Landscape architects landscape design for new build housing with green wall & Roof. Landscape architect’s services: Planning, Tender information & Completion. Landscape architects landscape design for residential development with play area. Landscape architect services: To planning with public consultation. Landscape architects landscape design for residential masterplan development. Landscape architect services: To Outline Planning. Landscape architects landscape design for refurbished residential building. Landscape architect services: Conditions, Tender, Construction information & On site. Landscape architects landscape design for new build mixed use development. Landscape architect services: Landscape appraisal, Planning. Landscape architects landscape design for a refurbished school. Landscape architect services: Consultation, Panning, Conditions, Tender, On site & Completion. Landscape architects landscape design for Home Zone residential development with play. Landscape architect services: Planning. Landscape architects landscape design for new build housing with intensive roof gardens in Conservation area. Landscape architect’s services: Planning to Tender. Landscape architects landscape design for new build housing development masterplan in Green Belt. Landscape architect’s services: Landscape appraisal, Planning. Landscape architects landscape design for new build housing with Home Zone and doorstep play. Landscape architect services: To Planning submission. Landscape architects landscape design for residential development with communal amenity and play. Landscape architect services: conditions to construction. Landscape architects landscape design for residential development with adopted Highways. Landscape architect services: conditions to completion. Landscape architects landscape design for public realm square. Landscape architect services: Concept Sketches and Visualisations. Landscape architects landscape design for residential development in Green Belt. Landscape architect services: Reserved Matters to Construction. Landscape architects landscape design for a new build residential development with play area. Landscape architect services: Planning submission. Landscape architects landscape design for new build offices in parkland setting. Landscape architect services: Planning, Conditions, Tender, Construction, On site, & Completion. Landscape architects landscape design for new build mixed use residential anchor development over a podium deck. Landscape architect’s services: Planning. Landscape architects landscape design for this new build Home Zone residential development. Landscape architect services: Planning. Landscape architects landscape design for new build student accommodation with courtyards. Landscape architect services: Planning, Conditions, Tender, On site & Completion. Landscape architects landscape design for new build mixed use development with public park & Home Zone. Landscape architect’s services: Conditions. Landscape architects landscape design for new build low density housing development with Home Zone, parks and play. Landscape architect’s services: Planning. The Landscape architect has the ability to improve our human experiences by the design of integrated communities and the creation of uplifting places which enable us to connect with our shared urban and rural environments. As a design focused company of landscape architects located in central London, we bring an imaginative and pragmatic design approach to each project we encounter. Our landscape architects thrive on the challenge of working as part of complex multi disciplinary design teams and believe that elegant landscape design solutions are achieved through the application of the intellect and the imagination. Our aim is to provide clients with landscape design solutions that are elegant, attractive and create meaningful public and private spaces. A landscape design should enhance the setting of any surrounding architecture, fulfill any technical requirements and stitch the development site seamlessly into its surrounding context. Our landscape architect’s experience includes all areas of landscape design and we are able to deliver all of the Landscape Institute’s Work Stages. Job Description for full details. If you are interested in joining our team, please submit your CV and portfolio to [email protected] by Friday 26th April 2019. We are please to announce the Vintry and Mercer Hotel, Mansion House, is now open for business. The majority of its hotel rooms are complete; its two restaurants are serving food and the Do Not Disturb basement bar is serving cocktails. The majority of the work associated with our input is now complete. This excludes the roof terrace, which is scheduled to be open in two weeks time. Our input into this project was split into two sections; a number of interior landscape interventions and the Mercer Roof Terrace. 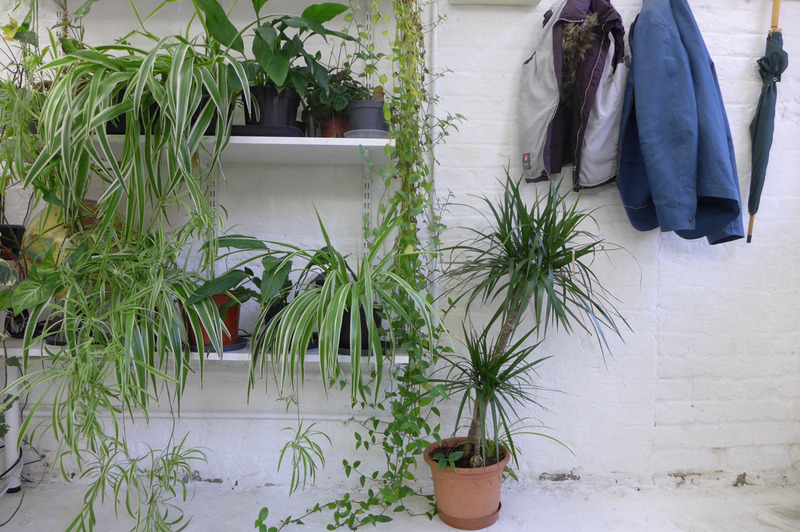 The main interior interventions included wall mounted planters to the Vestibule entrance area; skylight mounted hanging planters to the Vintry Kitchen; and eclectic planting to the reception area. We excitedly await the opening of the seventh floor roof terrace with its stunning views of St Paul’s Cathedral and The Shard. After a long decision making process we are please to announce that the Outline Planning Application for the Gascoigne West development along Abbey Road and St. Paul’s Road in Barking has been granted. The development consists of 850 residential units with a significant area of commercial/ community space. Located close to the River Roding and the flourishing Ice House Quarter arts district, this is one of a number of exciting new developments taking place in this area which will help to secure Barking as a desirable destination in which to live and work. We are please to announce work is now complete on the first phase of Mizen Design and Build’s Piers Place residential development located at the edge of Bulphan. This 2.8ha new build development contains 19 detached luxury houses located within Green Belt, each with an extensive private garden to the rear and front of the property. We have been successful in delivering this project from concept design, planning submission, tender and construction information through to the completion of the first phase. 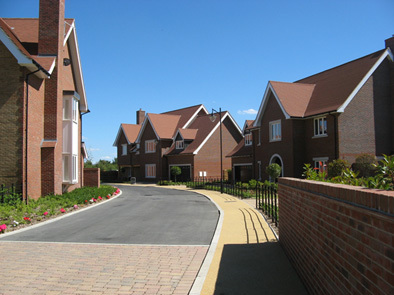 The spine road to this development adopts the principals of “home Zone”, encouraging slower traffic speeds. Two areas of the site are given over to play spaces, one of which doubles up as an ecological area. 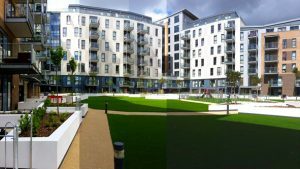 We are please to announce work is now complete on Galliard Homes’ Silver Works site in Colindale, north London. This 1.15ha new build development contains 227 residential units with 256m2 affordable work space. We have been successful in delivering this project from post planning stage through to completion. The landscape zone incorporates ‘home zone’ type principals and accommodates pedestrian circulation, above ground vehicular parking, play areas, a communal linear park with incidental pieces of play equipment and private gardens. 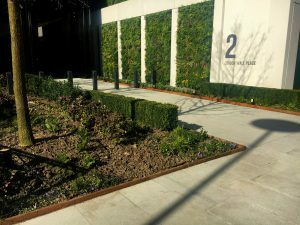 Part of the landscape zone is located over a basement car park and within this zone at grade tree planting has been accommodated. We were pleased to have recently attended the Maurice Wilkes Building practical completion lunch, hosted by St John’s College Cambridge. This prestigious office development has already let the majority of its 6,000m2 of lettable floor space and tenants are keen to move in. It was a pleasure to have worked on this smooth running project, a credit to all involved. The team included Client: St John’s College College Cambridge, Developer: Turnstone Estates, Architect: BCR Architects, Planning Consultant: Savills, Engineer: Ramboll, Mechanical & Electrical: Hoare Lea, Quantity Surveyor: Stace, Main Contractor: Vinci Construction. 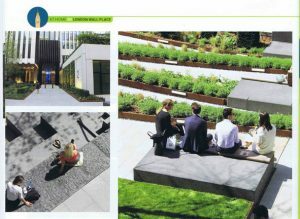 We are pleased to see the recently completed London Wall Place project in this month’s Landscape Insight magazine. We are proud to have worked with Frosts Landscape Construction Ltd and to have supported them in the detailed design of a number of significant elements. 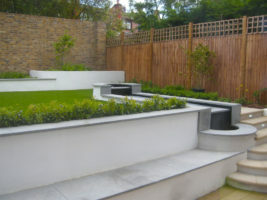 Our scope of works included the Coreten steel edging to the planters and building frontage and the detailed packages of information for three mock ups; the textured stone Clamber Terrace (to the remains of St Alphage Church), the concrete seat/ paving junctions and the textured stone water feature cascade. We are please to see our London Wall Place project nearing completion. Here are a few images of areas which are already complete. We were appointed by Frosts Landscape Construction to provide them with Construction status drawings to enable them to have certain elements of their package fabricated. The areas currently complete include the Coreten steel edging to the planters to the building frontage and the seating steps to the to the sunken area surrounding the St Alphage Church Tower Remains. We look forward to the 50m long water feature and the ramps and seating down to St Alphage Garden being complete in the near future. We are currently looking to appoint a Senior Landscape Architect and/ or Landscape Architect for an immediate or early start. The candidates will have a degree in Landscape Architecture as well as a Post-Graduate Diploma or Master’s degree in Landscape Architecture. The candidates must have a thorough working knowledge of AutoCAD or Vectorworks, Adobe Creative Suite and NBS landscape specification. It would be an advantage to have a working knowledge of Revit and Sketch-up. If you are interested in joining our team, please submit your CV and portfolio to [email protected] by Friday 02nd March 2018. We were pleased to see our St Luke’s Square landscape project, designed for Mizen Design Build, featured in this month’s landscape architect’s magazine FutureArch. 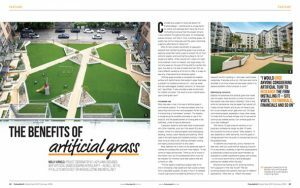 The article focused on the specification of a synthetic turf over a podium deck to a basement car park instead of living grass. The benefits of synthetic turf over living turf include a lightweight build up, resulting in a minimal load being imposed on structural slabs; a hard wearing surface which can withstand intensive use; a drought tolerant, attractive evergreen pedestrian surface; and the lower maintenance cost. We were pleased to attend the topping out ceremony for the Maurice Wilkes Building in Cambridge recently. This office development will offer around 6,000m2 of lettable floor space. This project is being developed by St John’s College Cambridge, being project managed by Turnstone Estates (client side) with the main contractor role being carried out be Vinci Construction. We have helped to secure planning consent on behalf of the client, provided information for the client to enable the tender of this contract and have now been novated to the main contractor. The anticipated completion date for this development is June 2018. We are please to announce that work is now complete on our St Luke’s, Caning Town, refurbishment/ change of use project. We have been working on this project since the planning submission stage. We prepared a ground floor landscape proposal for this detailed planning submission which responded to this change of use from commercial to residential, providing defensible space to all ground floor units on the inside and outside of this plot. Following the successful planning application we prepared tender information to enable contractors to build the landscape works. The entire courtyard landscape is located on top of of a sloping, stepped structural slab which tops the basement car park for this development. This courtyard space provides attractive private patios for all ground floor units to its perimeter and an area of grass with planting at its centre. A significant play ground area is incorporated into this central space. 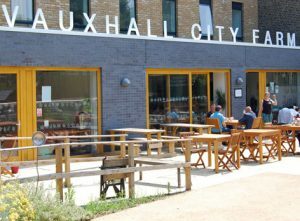 Work is now complete on Vauxhall City Farm’s refurbishment. These works formed part of a Section 106 agreement between St James Group and the London Borough of Lambeth. As part of this redevelopment the existing building was repurposed at ground floor level to provide a local cafe and improved facilities for the City Farm. Our brief by St James Group was to provide a suitable landscape setting for the cafe, space for an outdoor classroom and to provide a new duck pond. It was important to our client that these elements were stitched seamlessly into the existing surrounding context. After appearing as an expert witness for Galliard Homes in support of their proposed development in the New River Conservation Area in Islington, North London, we have been successful in appealing against the Local Authority’s decision to refuse Planning Consent. We were able to argue that the proposed landscape scheme satisfied the requirements of DM6.5 of the Islington Development Management Policies (DMP) 2013. We were also able to rebut the Local Authority’s Landscape Officer’s statements for refusal of Planning Consent. Work is now complete on Galliard Homes’ Crescent House residential development, located a few minutes walk from Clapham Common and within Clapham Conservation Area. This development refurbished a Tudor revival style building, originally constructed for the Union of Post office Workers, and made it suitable for use as residential dwellings. The existing landscape contained a number of significant elements which required retention. These included mature trees, an established hedge fronting onto Crescent Lane and existing brick walls to the perimeter of the site. Our landscape architects worked hard to provide landscape solutions which accommodated the existing features of the site whilst providing our client with their requirements in terms of car parking spaces, pedestrian and vehicular circulation and service vehicle access. Our landscape design locates a shared amenity space with a children’s playground to the building frontage, with private ground floor gardens with patios located to its rear. The external levels required our landscape architect’s careful consideration as they needed to interface with existing FFLs of the building. Footpaths needed be elevated to ensure level thresholds be achieved, Cellweb was required within root protection areas of existing trees and a gravel “French Drains’ were required the perimeter of the building as the damp proof course was 700mm below FFL. 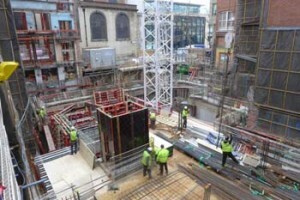 Work has now well underway on F R Holdings Garlick Hill Hotel site located in the City of London. This site is to accommodate a seven floor boutique hotel with a roof top restaurant and associated dining terrace which will claim stunning views of the City of London. Our landscape architects are working closely with the architects, interior designers and structural engineers to create a landscape design for the roof space which will feel intimate and comfortable whilst still maintaining those panoramic views of the City of London, including St Paul’s Cathedral and The Shard. In addition to the roof top garden our landscape architect’s scope includes the design of numerous landscape accents at every level of the hotel’s internal spaces. The hotel is due to open to the public in late 2017. 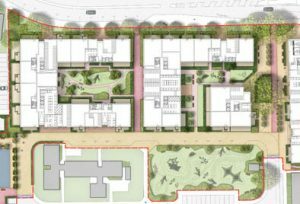 We are pleased to announce our landscape architect’s masterplan and supplementary information has been submitted to South Cambridge District Council and Cambridge City Council as part of a detailed planning submission for a new building and associated facilities on this 1.1Ha site located within St John’s Innovation Park, Cambridge. 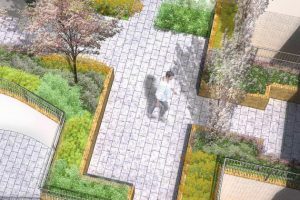 Working closely with the architect and engineers our landscape design accommodates planted swales and permeable paving as part of the site’s Sustainable Urban Drainage Strategy (SUDS). Parking, vehicular running surfaces, pedestrian footpaths, amenity spaces and structural planting all formed part of our remit. Once Planning Consent is given our landscape architects will proceed with the production of a tender package of information for the external works. The external works are now complete on a new shopping store for Aldi in Gershwin Park, Witham. This 1Ha site contains the store along its north boundary with associated car parking to its south. Our landscape architect’s masterplan incorporated a significant buffer strip of planting to the south and west of the car park to afford screening from the public realm and adjacent highway. Our landscape architects worked closely with the engineer to resolve the levels interface between the existing and proposed ground conditions. This ensured DDA compliant access was incorporated into our landscape design and falls were appropriate for surface water drainage. This store is due for opening in November 2015. 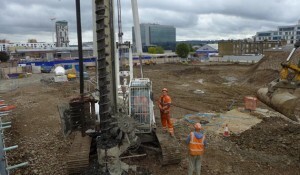 Work has now started on Galliard Homes’ Silver Works site in Colindale, north London. This 1.1Ha site is to contain a mixture of 1, 2 & 3 bedroom apartments and a number of 4 bedroom town houses. 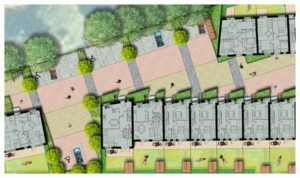 Associated with these 182 dwellings, our landscape design incorporates parking (above and below ground), play areas, communal garden and private gardens. Our landscape architects have worked closely with the client’s design team to achieve the successful sign off all landscape architect’s pre commencement Conditions. Our landscape architect’s masterplan and construction package of information is now being implemented and the project is due for completion in spring 2017.